★ Drunk Stoned Brilliant Dead: The Story of National Lampoon (Sky Atlantic, 9pm) Documentary looking at the history of the famous U.S comedy publication, best-known worldwide for the comedy films that carry its name. The Mad World of Donald Trump (Channel 4, 9pm) Documentary on presidential hopeful Donald Trump, whose move into politics has caused a lot of controversy because of his right-wing views. Murder Games: The Life and Death of Breck Bednar (BBC3, 9pm) Docudrama about the murder of a 14-year-old schoolboy, who was lured to death online. Beatrix Potter with Patricia Routledge (More4, 9pm) Documentary following in the footsteps of the author, to celebrate her 150th anniversary. 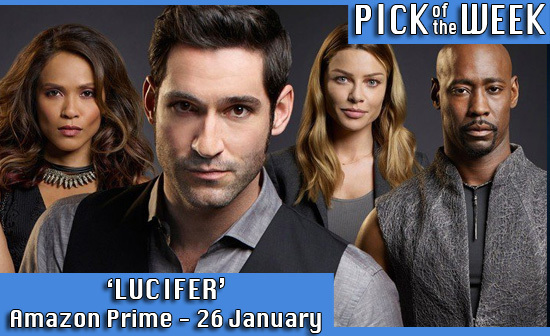 ★ Lucifer (Amazon Prime) Season 1 of the U.S supernatural cop drama about the Devil helping the LAPD with cases. Troll Hunters (BBC3, 9pm) Documentary about the modern phenomenon of 'trolling' online, hosted by vlogger Em Ford. Children Saved from the Nazi's: The Story of Sir Nicholas Winton (BBC1, 10.45pm) Documentary about how Sir Nicholas Winton rescued 669 children from Nazi extermination, who kept his heroism secret for 50-years. ★ George Clarke's Amazing Spaces (Channel 4, 8pm) Special edition of the series, focusing on a custom-made floating home.